G2 Collaborative Wendy Gilbert is originally from Connecticut but has lived in the Rio Grande Valley for over 20 years. Fred Gonzalez is a McAllen native. Both are graduates of UTPA. 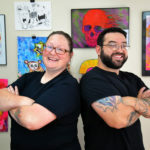 The G Squared Collaborative began in 2011 through our collaboration (Gilbert & Gonzalez) as middle school art teachers at DeLeon Middle School in McAllen, TX. While their personal art styles are different, both agree that process, creativity and experimentation are the center of a strong visual arts program. The team has personally work in a variety of materials both 2D & 3D, traditional and digital. Experimentation is the heart of artmaking. Using different types or art media together can result in fun and fascinating things. Mixed Media Madness is taught by Wendy Gilbert, a local artist and experienced K-12 Visual Arts teacher. In each class, we will mix and match materials to create fun and interesting art. Media will include Gelli printing, watercolor and cardboard. For artists and non artists alike. Be prepared to get a little messy. An apron and a sketchbook are recommended. This is a great class to take with another person. We encourage parents and their older children, couples, and friends. Come be creative together with The G Squared Collaborative. There will be a materials fee of $30 payable to the G Squared Collective at the 1st class. Cash and Card are accepted. Taught by Wendy Gilbert, G Squared Collaborative, Founder & Instructor communities. Jump in! and take a lesson you’ll open up the doors to a world of life changing creative experiences.